For Airman Group X (Technical) Trades : Passed Intermediate/ Equivalent examination with Mathematics, Physics and English with minimum 50% marks in aggregate and 50% marks in English or Passed Three years Diploma Course in the following streams from a Government recognized Polytechnic Institute with 50% marks in aggregate, and 50% marks in English in Diploma or in Intermediate/ Matriculation. For Group Y (Non-Technical) Trades : Candidate should have passed Intermediate/ Equivalent Examination in any stream/ subjects approved by Central/ State Education Boards with minimum 50% marks in aggregate and 50% marks in English. 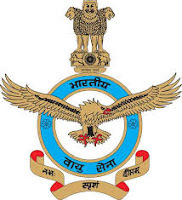 Indian Air Force Selection Process : Selection will be based on Written Test and Adaptability Test-1 & Physical Fitness Test (PFT) and Adaptability Test–2, Medical Examination. How to Apply Indian Air Force Vacancy : Interested Candidates may apply in application along with Original and four self-attested photocopies of Matriculation Passing Certificate, Original and four self-attested photocopies of Matriculation Marks Sheet/ Intermediate Equivalent Examination or Original and four self-attested photocopies of Three years Diploma Course Passing Certificate and Marks Sheets of all semesters at reporting up to 10 AM on 04 November 2017 at the Rally Venue will only be permitted to appear in the Recruitment Test.